After months of anticipation of racing an distance with the word “Iron” in it, I’ve accomplished my goal of completing 70.3 miles of swimming, biking, and running. Although this race is technically just a stepping stone on my way to the full Ironman, it was a huge accomplishment and definitely one of the most fun races I have ever participated in. I enjoyed every second of my journey. Caution: This recap is going to be VERY long and detailed, mostly because I want to document every moment so I can revisit it in the future when preparing for races. Also, I’m just not good at writing short entries! I took a half day from work on Friday in order to get to the expo and also make sure I got in a easy workout. After 20 minutes of biking and 10 minutes of running (I had considered a 10 minute swim in the ocean in my wetsuit but knowing the temperature was going to be really low on race morning, I skipped it since I didn’t want to be sitting around in a cold, wet wetsuit prior to the race), I relaxed for a bit until Mike came home and then we made our way to the expo. The expo was really well organized. 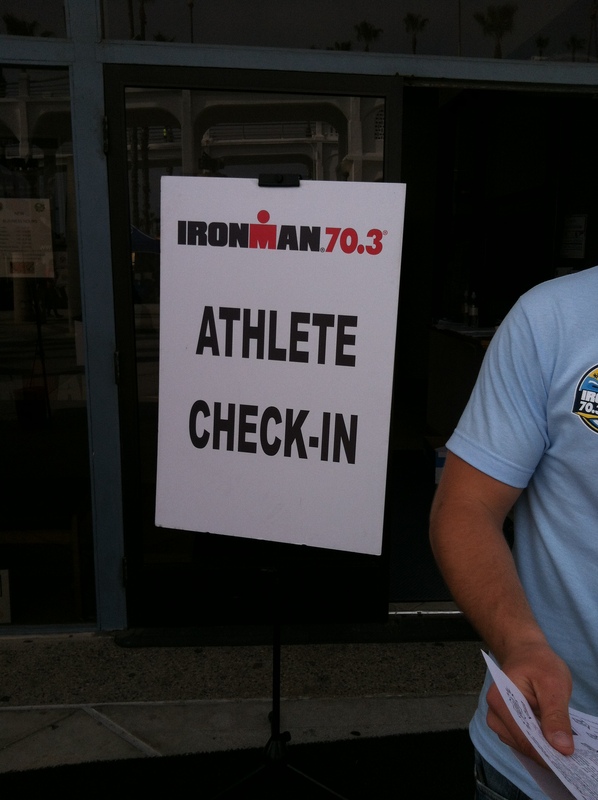 Athlete check in was like a well-oiled machine. Despite there being about 10 different stations that we had to hit up to get all our gear and sign all the waivers, it went quickly and smoothly. The energy at the expo was electric – you could feel the excitement and nervous tension in the air. After we got everything in order and watched part of the safety video, we made our way through the gauntlet of vendors and purchased a couple of things at the official Ironman Store. I was tempted to buy more than just the water bottle and hat that I did, but I figured I’d wait and buy all the good stuff at CdA, when I could officially wear the M-Dot logo. Mike wanted to buy laces for his shoes so we went to our local bike shop’s tent (also the official Oceanside 70.3 bike shop) to purchase them. While there I saw the neoprene caps. I tried two on and one was actually quite comfortable. I’d been meaning to buy one and then swim it prior to the race, but I never got around to it since I’ve been so busy lately. I decided that I’d buy the cap and wear it the next morning even though I never had swam in it before. I know they say never to try anything new on race day but I was willing to take the risk in order to stay warm in the sub-60 degree water! After the expo we headed home and had our typical homemade chicken sausage pasta dinner and then put all of our stuff together. Getting our bags packed was much more time consuming than expected (although I guess I expected that). Since there are two transitions at Oceanside now, we were given three plastic bags to store our things in. We had a morning clothes bag that we would put our clothes in that we wore in the morning, a bike bag that we would essentially pack our T1 stuff in and then during T1 we’d have to stuff our wetsuit and towel and all items into so that it could be delivered to T2, and a run bag that we would put our run gear in and keep at T2. This mean that if you needed something, like sunscreen, in both T1 and T2, you need two of them. Also, if you put something in the wrong bag, you were screwed. 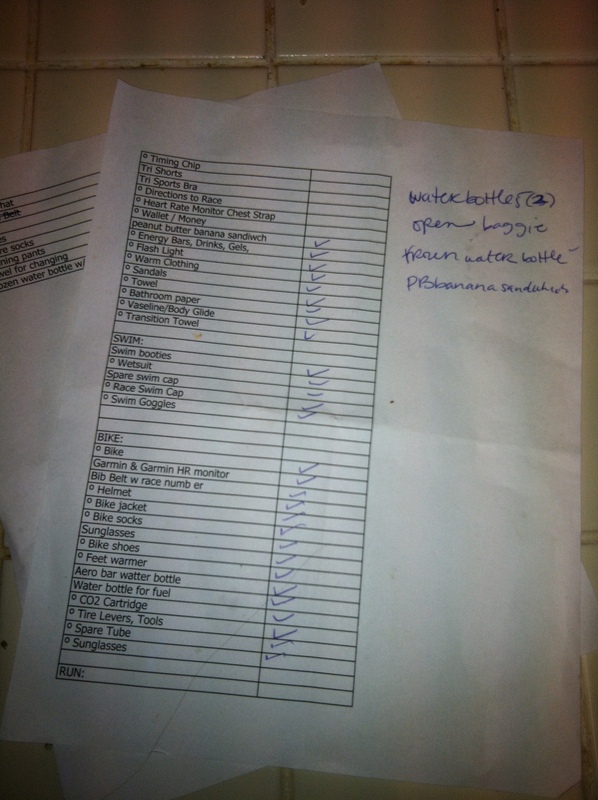 Being the nerdy accountant with a love of spreadsheets that I am, I made myself a detailed check list with items that needed to be packed for each portion of the race. I printed it out and used it to pack. When we got in bed on Friday night I felt like I hadn’t rested nearly enough and was on my feet way too much throughout the day. I definitely think I’ll be going to the expo two days before any long course triathlons from now on! However, despite my nerves, I fell asleep quickly and slept deeply. The alarm went off at 3:40 AM and we hopped out of bed quickly and started getting things ready. As I was braiding my hair I joked to Mike, “I feel like Katniss on the day of the Reaping,” (Hunger Games reference in case you aren’t in the loop) mostly because I was braiding my hair but also because I was nervous! We were both in a great mood as we got everything packed in the car, went to 711 for coffee and drove to the race, blaring the radio and singing along (“That Sh*t Cray” was suddenly inspirational). There was no race traffic and parking was a breeze. 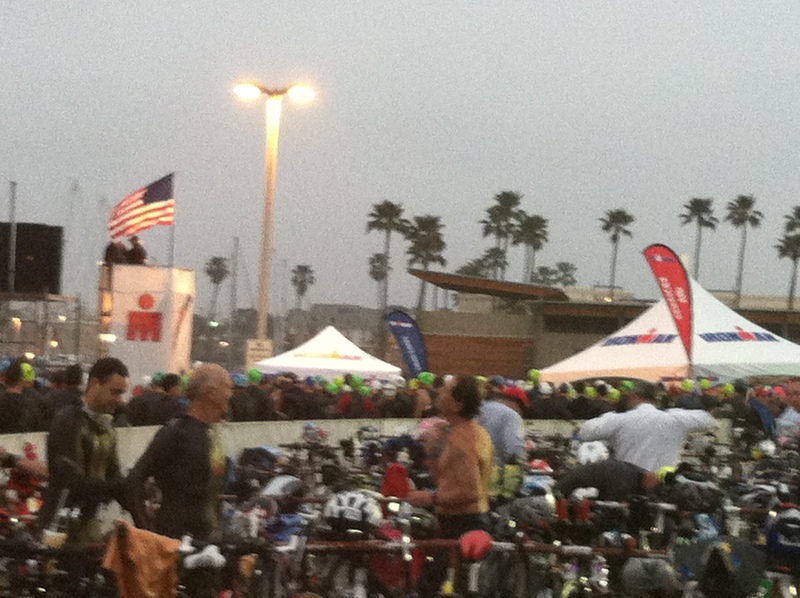 We set up our areas in T2, scoped out the bike in and run out areas, and then got on our bikes to ride to T1. It was difficult to carry our two plastic bags (the “morning clothes” and “bike gear” bags) loaded with gear and ride our bikes (backpacks that won’t fit inside the bike gear bag would be left behind), so Mike carried one of mine. 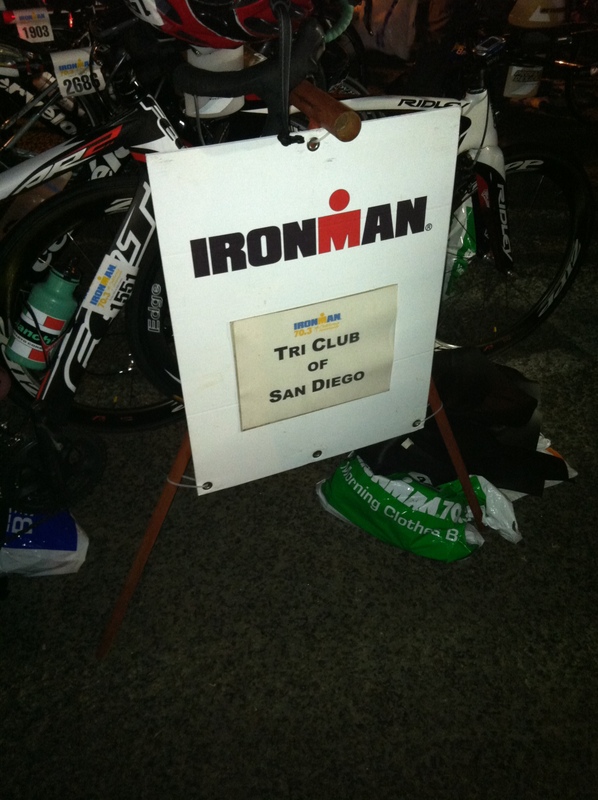 We got to transition while it was still dark and found the Tri Club of San Diego bike racks where we would all be setting up (we signed up in advance to be placed with all the other TCSD athletes rather than with our age group). As soon as Asia and Jeremy arrived, Asia and I headed to the bathroom at whcih point I realized that I had forgotten to eat my breakfast! I brought a peanut butter banana sandwich but with all the activity going on had nearly forgotten to eat it. Once we made our way to our spot in T1 (T1 was like 400 meters long it seemed), we realized that our light blue capped wave start was nearly to the front of the line! There was only one wave ahead of them before they would be lining up to enter the water. We got a little panicked and ran back, put our Morning Clothes Bags in the designated buckets, kissed our boyfriends (who were in later waves) and ran all the way down the chute to the front where our wave was waiting. We did some dynamic stretching while we waited and nervously chatted in anticipation. I couldn’t believe that the race was about to begin! Once we our corral left the chute, we walked down to the boat launch area. Luckily on the way we saw Jeremy’s mom who gave us last minute words of support and took our picture. After the wave in front of us started, we had a few minutes to swim out to the start buoys and collect our selves before the horn went off for us. As soon as I got in the water, I put my face in and blew bubbles out, just like I had read to do. The water was cold (58 degrees) but not THAT cold surprisingly. I got the water in my wet suit and swam out to the buoy slowly. I positioned myself in the middle of the two buoys, about three people back from the front. I knew I would be one of the faster swimmers, but not the fastest, and I didn’t want to get too close to the buoys that we’d be swimming by because I knew that fast swimmers from the waves behind me would be catching up quickly (wave starts were 3 minutes apart). Asia and I Are Ready to Swim! When the horn went off, it was temporary chaos. 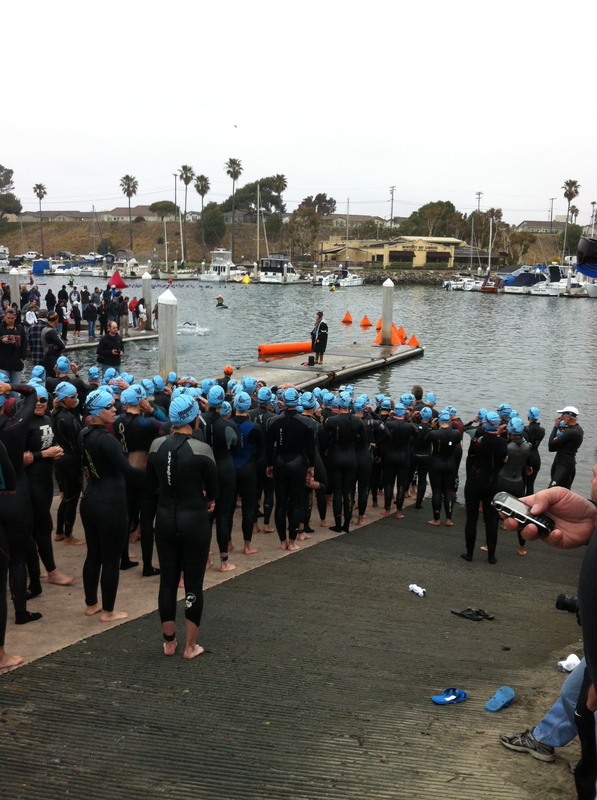 I got a little taste of what the mass swim start at CdA will be like (except that is an even more petrifying beach start) – people were kicking, thrashing and just trying to make space for themselves. I attempted for about ten seconds to draft off a girl but quickly realized she was swimming too slow so I tried to go around her. It definitely wasn’t as easy as I thought it would be to navigate the waters with all these women! At some point I got my rhythm. My breathing wasn’t too hard, but I was definitely putting an effort out. The swim course is a bizarre shape – you never really swim straight. The buoys are to the left and I always breath on my right, so I pretty much sighted by lifting my head and looking up. 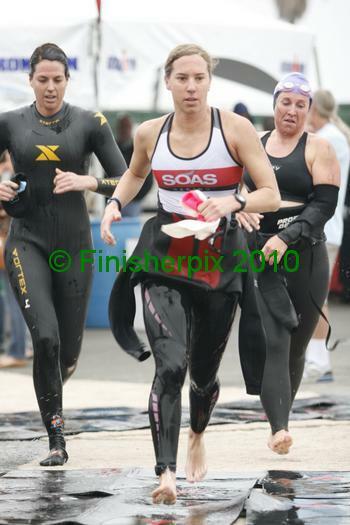 I know how to swim with bilateral breathing, but for some reason in the race I never decided to use this skill. I kind of followed people around me when possible but in general, I never really felt like I knew exactly what I was doing. When we reached the first “turn” which was more of a slight left, I started passing people from previous waves. It was really distracting to keep dodging them. Often I’d swim along next to them and suddenly we’d collide because one of us wasn’t swimming straight. At one point, a man ahead of me just suddenly stopped swimming and started treading water right in front of me and I had to veer quickly off to the side to avoid hitting him. Once we got out of the harbor into the basin, the waves started really picking up. When I lifted my head to sight a few times, I lost sight of any buoys at all. Eventually I got sight of the red buoy which signified the turn around point and focused on just getting there. Once I made my way around both red turn buoys and was heading back, I felt better. However, the course was still not straight and was now veering slightly right. Since I tend to swim a bit to the left when I swim, at one point I came out of the water and had entered the no man’s land between the two sets of buoys and was literally all by myself. I didn’t see any other swimmers or any buoys at first and started to panic. I even spoke out loud and said something like “what the heck!? !” However, I figured out that I was veering left and the course was veering right and redirected myself. Unfortunately my redirection ended up in me zig-zaging my way back until we reached the final stretch which was pretty much straight and was right along the shore. It was nice to see all the people cheering us on on the shore. At this point, the waves behind me were passing me and I was starting to feel like I really screwed the swim up. However, I just focused on getting to the shore instead of dwelling on it. I was still passing waves in front of me, so it was actually quite crowded. When I took a look ahead, I saw at least 8 different swim cap colors! 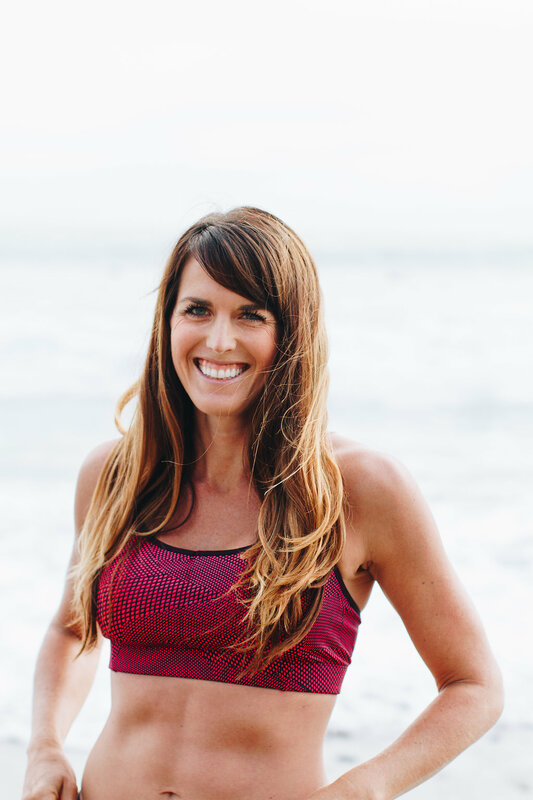 Although I was very relieved to be finishing the swim, I also felt like I had plenty of energy left to conquer the rest of the race. Although disappointed that I wasted time with my terrible sighting and zig-zag swim patterns, I was happy that I felt like I could continue swimming if I needed to and that I wasn’t exhausted. 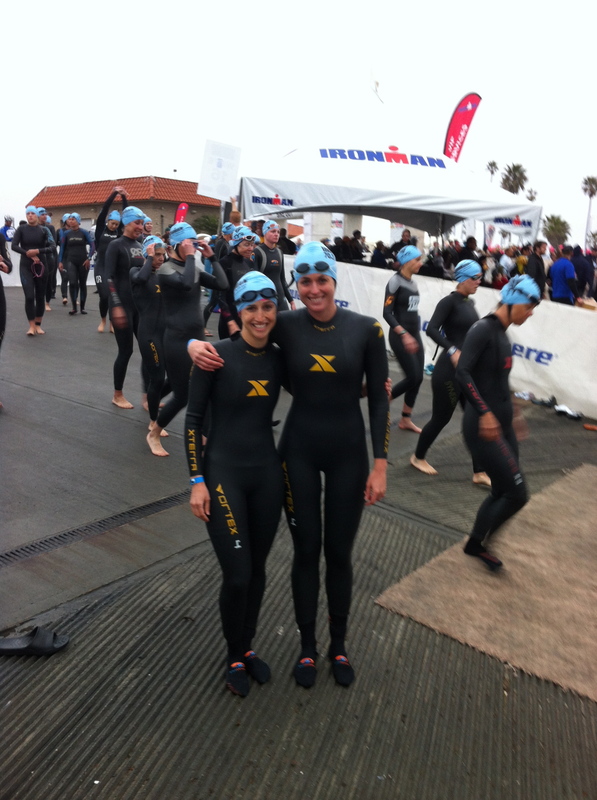 As I reached the boat dock, a volunteer grabbed my hand and pulled me out of the water and unzipped my wet suit for me. I started rolling it off my upper body as a I ran do the very long stretch back to transition. Once I got into transition, I had to run all the way back to the front of transition where my bike was racked, near the “bike out” sign. Once I got to my bike, I put on my heart rate monitor, tank top, arm warmers, helmet, sun-glasses, socks and shoes. I checked my Garmin for the time and was relieved to see that at the very least I had gone under 40 minutes. I was hoping for closer to 35 but at least I didn’t go over 40. 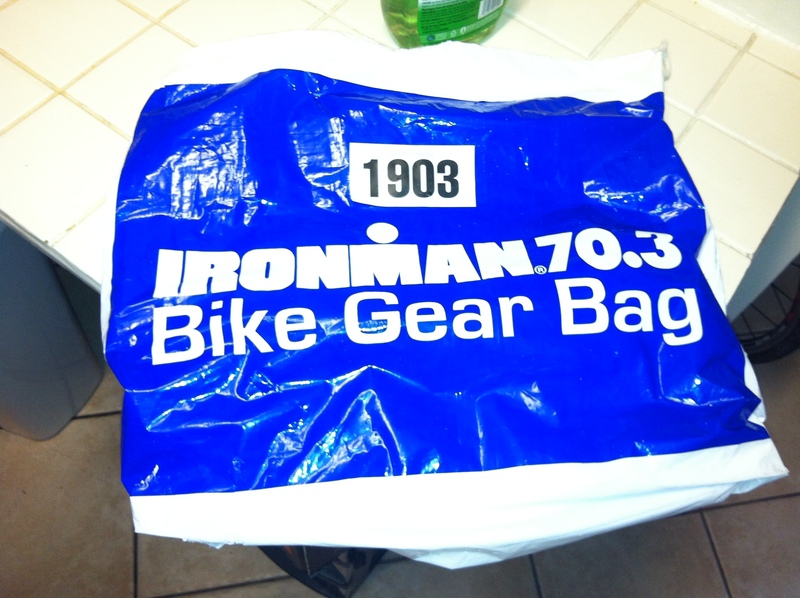 After I got all my gear on, I stuffed my wet suit and all my other T1 gear into my “Bike Gear” plastic bag so that it could be later transported to T2. I took one last look, grabbed my bike and headed down the last little stretch of chute before the bike mounting area. I got on my bike and rode away, excited to take on 56 miles of road! Bike and Run recap coming soon! 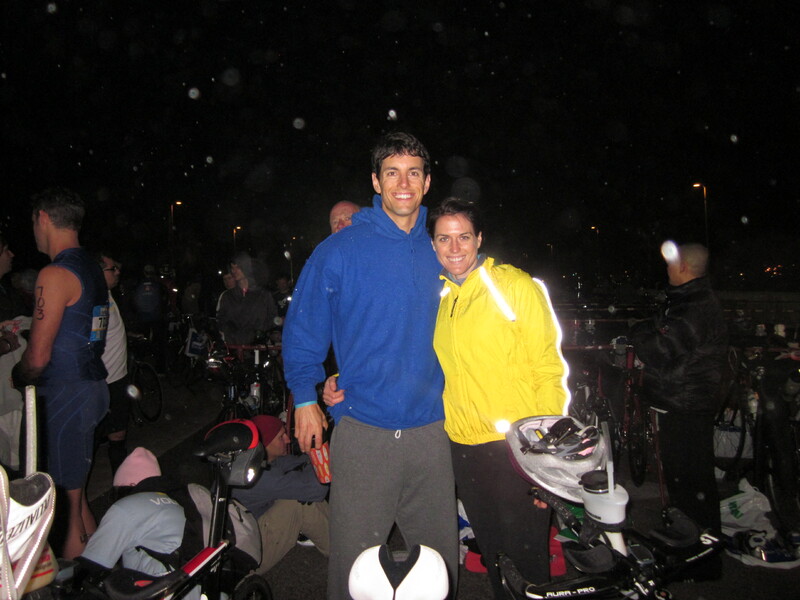 « Ironman Training Week 17 – Half Ironman Race Week! Awesome, can’t wait to hear about the bike! Ah! I got so excited reading this. Even with zig-zagging you still killed the swim. Can’t wait to read the rest. Super exciting; I got some heart palpitations reading about the swim chaos!! Can’t wait to read the rest! great job on the swim! it was much choppier than i expected, too. just makes me look forward to the lake swim for cda! on a random note, i’m actually in that picture of our swim wave – in the back, looking toward the right – haha! may have to borrow that one : ) looking forward to reading the rest! Ahh! I’m so bad at sighting! At sherox the boat had to yell at me with a loudspeaker to say I was going off course. so embarassing! Sounds like you’re doing great. off to read part 2!